International Seating and Decor has become a leader in the production of custom designed interiors. With us you are not locked into standardization or off-the-shelf items. 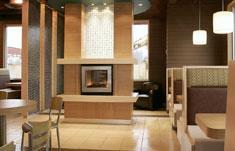 We offer unlimited choice and infinite flexibility in our complete line of seating, decor and commercial millwork. Since our inception, we have evolved into a multi-faceted supplier and continue to expand both our product line and portfolio of national clients. Our professionals have a wealth of experience to draw from and consistently work together with our clients to successfully deliver the industry's highest standards. Our extensive product lines and production flexibility help us provide the kind of diversity that is demanded from our customers. We combine the efficiencies of industrial scale production with the precision and control of handcrafting. Quality is the essential element of our manufacturing process. Please visit our website for more information on our products and services.